On the 29th September 2016 Payload Asia held its 5th Annual Awards ceremony and gala dinner in Hong Kong honouring the very best in the industry. Payload Asia continued its unique awards approach which began two years ago, with a second parallel set of awards, meaning for each category there are two awards: The Customer Choice Awards and the Industry Choice Awards. 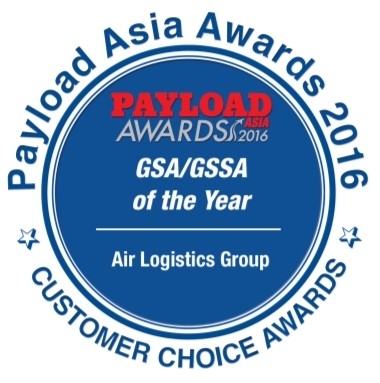 We are pleased to announce Air Logistics Group was voted winner of GSSA of the Year 2016, Customers choice. ‘We are extremely honoured to receive the award, especially knowing that it has been voted for by our customers’ comments Vikram Singh, Regional Director Asia Pacific. ‘We are dedicated to providing the best tailormade service available to our airlines and freight forwarders alike and pride ourselves on maintaining the highest standard of customer service’.